My husband is incredibly hard to shop for. I know, in general, what a lot of his favorite things are - books, video games, comics - but I couldn't tell you which particular game he wanted, or which books he didn't already have. So, over the last 20 years, we've developed a system for the "big" gift of the season. I ask him what he wants, and then we go buy it together. That way, he gets exactly what he wants. He then wraps his own gift and puts it under the tree! I do like to get him smaller things, often surprises, that I think he'll like. I picked a few things I think many men would like to get as a gift... and maybe some women, too! My husband shaves every day for work. I've tried getting him to grow a beard for me, but he can maybe get about 2 weeks growth, and then he can't take it any more. 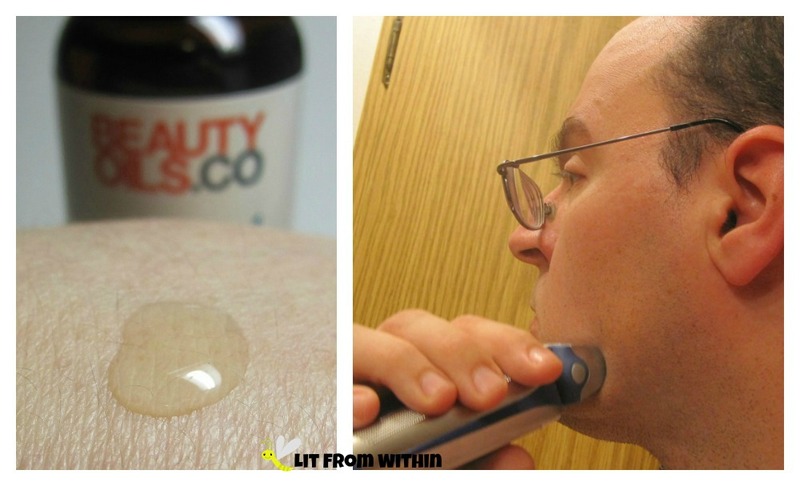 He gets 5 o'clock shadow by noon, so I thought he might like this All Natural Restorative Shaving oil from Beauty Oils.Co to help him get the closest, most comfortable shave he can get. It's full of wonderful, natural oils like peppermint and rosemary that smell good, are naturally anti-bacterial, soften his beard, and help keep the moisture in his skin. And, its formula is vegan, cruelty-free, and free from preservatives, parabens, and petroleum products. My husband usually showers in the morning, and then feeds the dogs and a few other things before shaving. He's been applying this shaving oil right after he finishes his shower, and by the time he shaves, it's soaked into his skin. He said that he felt like his beard was easier to shave, and it didn't clog his electric razor, either. If he wanted to, he could use a few drops of oil after he shaves, too. He was enjoying it so much, I decided to try it for myself! While in the shower, I applied a few drops to my legs, and shaved them so smooth - I didn't need any shaving lotion! Usually I apply lotion to my legs after I shave, but after the oil, I didn't need it. My legs were smooth and soft. I guess he's going to be sharing this shaving oil with me! 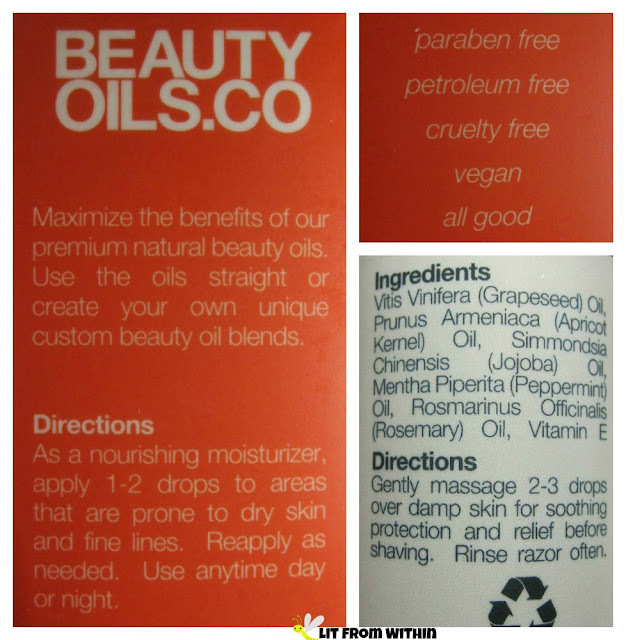 BEAUTYOILS.CO All Natural Restorative Shaving Oil is available at on the BEAUTYOILS website, or on Amazon for $14.95. My husband used to be a runner in his youth, but after several injuries he found running to be too hard on his body, so he's been looking for other ways to work out. With this Live Infinitely Stability Ball, he can add another element to his flexibility and strength training. The size of the ball selected depends on the height of the person and what it's intended for. This ball is strong enough to be used every day as an ergonomic office chair (and they suggest getting the largest size if that's what you intend to use it for.) Otherwise, it's best to pick the size best suited to the height of the user. When sitting on the ball, the thighs should be parallel to the floor. This ball is so easy to fill. I thought I'd need an air compressor, but the included pump is fine. I filled the ball about 80% at first and then left it to stretch overnight, then filled it up the rest of the way. It's amazingly durable - it can support up to 2200 lbs and, even if it's punctured, it will slowly deflate - not burst! The first time Mr. LitFromWithin used the ball, our little dog had to try and get up on it, so I was really glad that her little nails didn't puncture the ball! 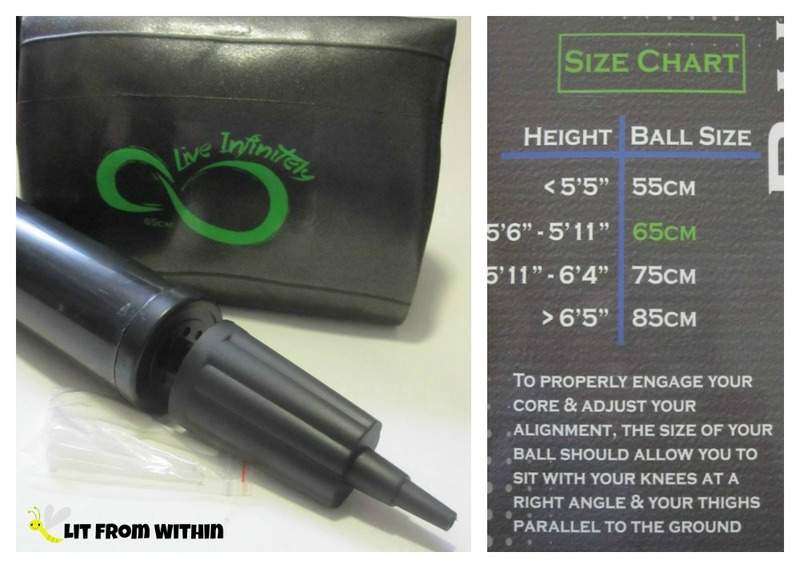 There is a great e-booklet of suggested exercises with pictures that comes with the purchase of this ball. There are so many different ways to incorporate this ball into a workout. Years ago, I used to use a ball like this at the gym to stretch out my hip - I had it reconstructed as a toddler, and lost a lot of range of motion in it. I had a trainer suggest sitting on a ball like this and rolling in a small circle to stretch out the inner thigh and hip muscles and provide some pain relief to my hip. Now that we have this ball in the house, I'm going to try that technique again, and maybe even try some of the stretching exercises. Guess this is another gift he's going to have to share with me! The Life Infinitely Exercise Stability Ball is available on Amazon in prices ranging from $21.99 for the smallest ball to $28.99 for the largest. They offer a 100% money-back guarantee if you're not completely satisfied. Maybe dance lessons aren't exactly on your man's wishlist, but hear me out: The Daily Mail reported on a study done at the University of NorthUmbria that a man's dance moves can not only attract a lover, but also signal to other men that he may be a rival! Some of it is the dance moves, and some of it is about the confidence and the strength he shows as a lead - and dance lessons can certainly help with all three of those! 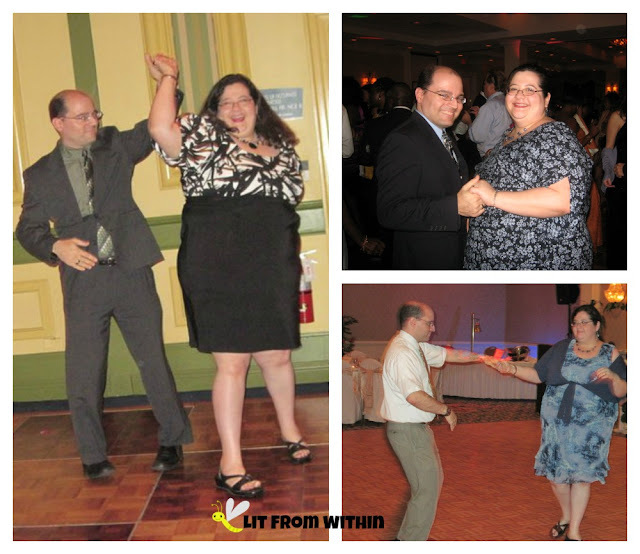 Years ago, my husband and I took dance lessons to prepare for our wedding. Those dance lessons would serve as the foundation for many years of dancing fun we've had at other weddings and holiday parties, and going to dance clubs. We've gone to different studios over the years to get refresher courses or learn new dance moves, but my husband really hasn't found a class he's enjoyed. He likes to move at his own pace, and he doesn't like to be singled out by the instructors and be made the center of attention in class. 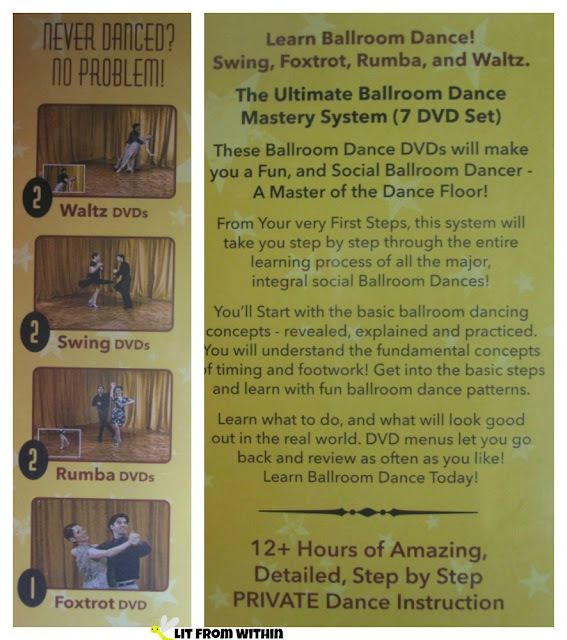 The Dance Crazy Ballroom Dance Mastery System DVDs are the perfect way for us to refresh our skills on dances that we love but don't use often, and to learn a few basic steps of new dances. We can dance for hours using just a few basic steps - these DVDs teach at least two basic steps for moving around the dance floor, and a few easy flourishes to make each dance more fun and more exciting to watch. I really love the format of the DVDs, too. Each dance is broken up into lead and follower steps, shown in different angles, and then put together and then to music. Sometimes, the instructors give lessons on dance floor etiquette, or additional tips on how to hold your frame, or rolling the hips. It's easy to move through the chapters to skip to the parts you want to review, or to replay a section you want to watch again. With these four dances, we can dance to just about anything we want to. The waltz works for a lot of country/western songs that are in 3/4 time; the Rumba works for a lot of Latin rhythms; and the Swing is good for more than just Big Band music! This makes a great couple's gift, too. And, it's the gift that keeps on giving, because it makes every party a little more fun. No more sitting around at weddings, or only doing the YMCA or Chicken Dance! The Dance Crazy Ballroom Dance Mastery System is currently available on Amazon for $47. When I got married, over twenty years ago, we didn't have a lot of money for our wedding jewelry. My husband's ring was very thin, and got bent up and scratched pretty quickly. He did the best he could for many years, getting it bent back and cleaned at the jewelers, but a few years ago, I convinced him to shop for a new wedding band - and an obsession was born. He has really enjoyed collecting different bands, and even coordinating them with his outfits. He has different metals and finishes, ones that look like wood grain, and ones that have colored stones or bands. 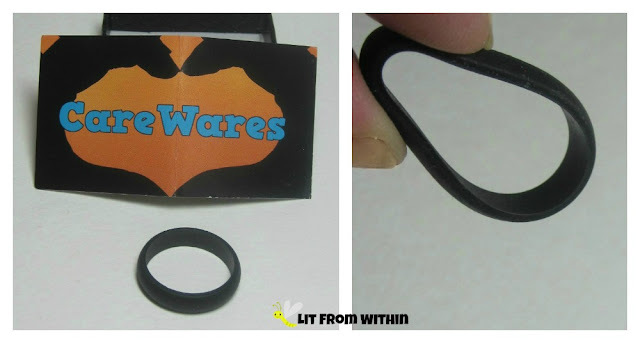 And now, he has a silicone band from CareWares. This wedding band is so cool. It's matte black, smooth, with rounded edges for a nice finished look. It's lightweight, flexible, and has a little bit of give while still maintaining its shape. I remember my Dad telling me that he never wore his wedding band because he used to work with tools and machinery that could get caught on his ring and possibly damage or remove his finger! If he had one of these rings, he wouldn't have had to worry about that. This ring is perfect for the rugged life - nothing to get scratched or dinged. And, it comes with a lifetime guarantee! It's a very unique-looking ring, too. The first time Mr. LitFromWithin wore it out, he got asked about it! Even our dog, Banjo, is curious about it. Do you think he'd be happy to know that 10% of the proceeds go to charity? I think it looks great on my husband... but wait... it also looks great on me! Look how well it matches my Cult Nails Fetish nail polish. Even if I don't wear it as a wedding band, it makes for an interesting right-hand ring, too. I don't think he'll mind if I "borrow" it from time to time. Or if it ends up in my jewelry box. It's available on Amazon for $10.95. At that price, we may just have to get matching bands! The last item I have on this list came as a bit of a surprise. I was all excited to get it for ME. 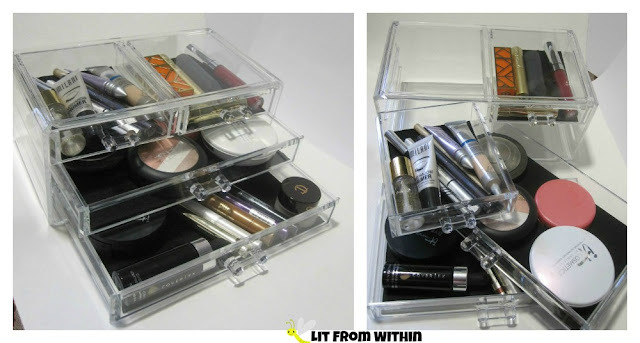 I love organizers, and this Estilo Cosmetic Organizer is so attractive and useful. I love how the acrylic is sturdy and clear. All the drawers are lined with soft black felt, and the drawers can be removed completely from the organizer to be cleaned or moved around. 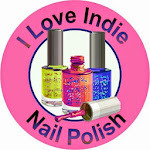 As soon as I got it, I pulled out a selection of my favorite cosmetics - things I reach for all the time. I can fit a nice selection in there! But, let's be honest. My collection of cosmetics is really, really big. I would need a lot of these boxes! My husband really liked the clean styling, and the ease of storing and viewing his jewelry collection. In addition to the rings, he also loves watches - especially Superhero ones! I guess with all the gifts I've stolen from his wishlist, it's only fair he steals one from me! The Estilo organizer is currently available on Amazon for $18.99. Have you made up your wishlist yet?